I love that we’ve been having some decent weather lately. It feels almost like summer. This past weekend it was in the 80’s on Saturday and mid 70’s Sunday. After spending a crazy busy weekend getting things done and working in the dirt, my garden was finished and Michael and I wanted to have our friends over for dinner. Good weather NEEDS a BBQ in my opinion. We invited our friends over whom we went to Hawaii with last year. They brought their 5 year old and new(ish) baby who has learned how to smile. 🙂 So cute. Our friends are gluten-free (Mike is actually very allergic to gluten!) so I looked for a marinade for the chicken breasts that was gluten-free. I found one that ended up being perfect. I marinaded the chicken breasts (organic from Costco) for about 2.5 hours. All everything together in a bowl and whisk. I used La Choy soy sauce because it’s gluten free. It’s actually pretty good. I’ve read some reviews that people don’t like it, but Michael is a fan. He says it has a coffee flavor. I’m indifferent. I don’t notice enough of a difference from the regular soy sauce we used to use. I left out the salt because I think soy sauce has enough sodium in it. I never add salt to recipes that call for soy sauce. I also didn’t have any parsley so I skipped that. The recipe called for 1 1/2 cups of vegetable oil but that seemed like a LOT to me. I used 1 cup and that was plenty for 6 chicken breasts to marinade in. I whisked it all together and we grilled the chicken up. 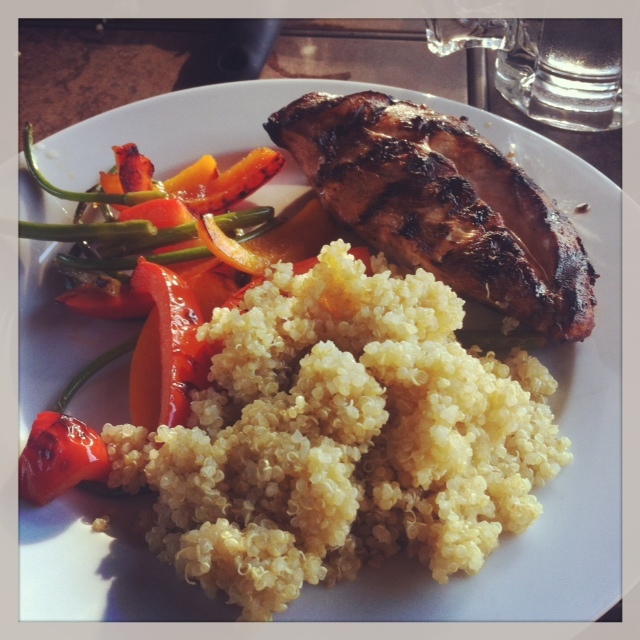 I cooked up some quinoa (gluten free) and Michael grilled some fresh veggies. 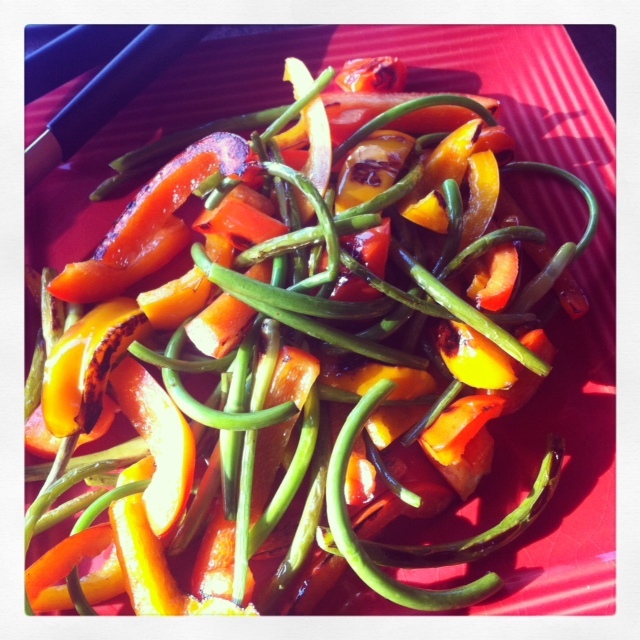 I cut up a red and yellow pepper and our friends brought scapes. I’ve never heard of scapes before. Have you? Susanna got it from her garden. I took a bite of it raw and it was like a cross between raw garlic (spicy) and green onions. When cooked, it tastes more like cooked garlic or a cooked yellow onion. It was quite nice! I cut them into smaller bite sizes and sauteed them on the grill with the peppers. Everything went together nicely and it was a good dinner for lounging outside. We had dessert–which I didn’t take a picture of and wish I had — which was awesome!! I see myself going to the farmer’s market soon to get the things I need to recreate this meal. Dessert was vanilla bean ice cream topped with rhubarb. Susanna diced the rhubarb up into small bite sizes, put in a skillet with some water, and cook it until the rhubarb is soft. It took her about 5 minutes or so for it to soften. We topped the ice cream with the rhubarb for a fantastic dessert. The tart fruit went perfectly with the sweet ice cream. Loved the combo! I haven’t had rhubarb since I was a kid and it was in a pie my aunt made. After dessert we all went for a walk down the street to the nearby school. The sun was starting to lower in the sky and the temperatures were dropping but it was still a nice after dinner walk. 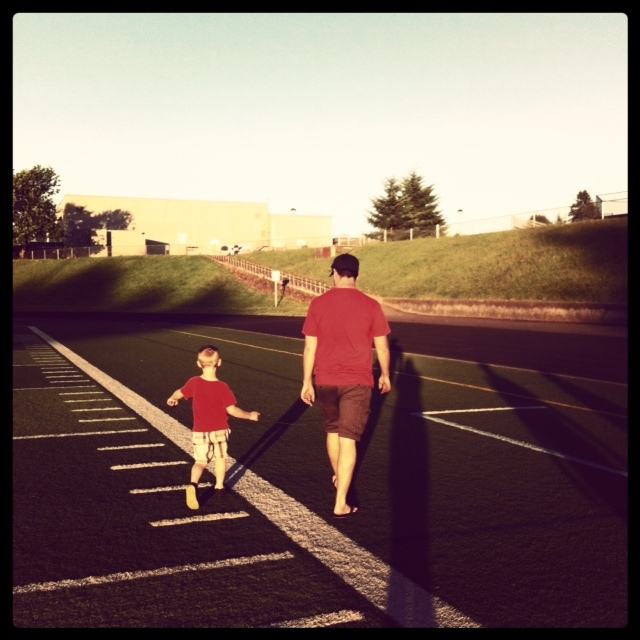 We took the 5 year old down to the football field to run around and get some energy out. It was a nice little evening and I’m super excited that I tried two new foods. I can’t wait to find them in the farmer’s market! QUESTION: Have you ever tried scapes? What’s your favorite way to use rhubarb? 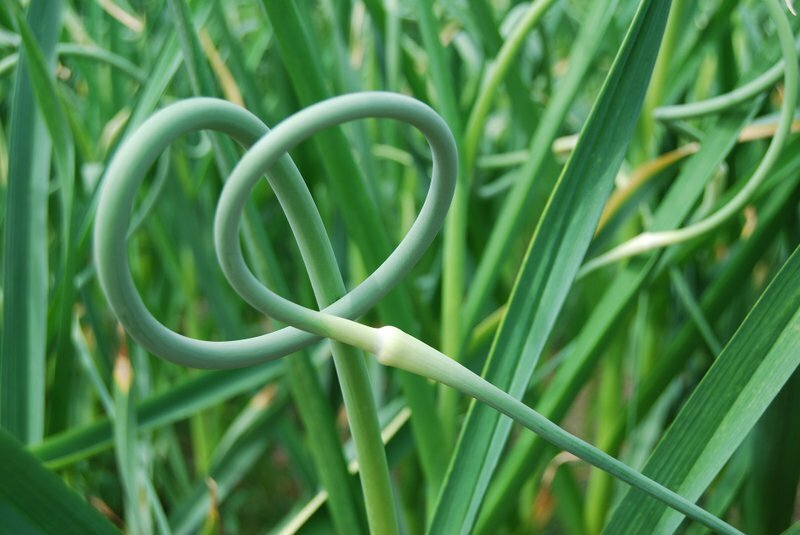 I’ve heard of garlic scapes but have never had them. They sound good! The chicken marinade sounds good, too. I don’t buy rhubarb often (should buy it more). When I do buy it, I usually make a sauce with it. I can see how it would go really well with vanilla ice cream. What a great idea! I didn’t even think about making a rhubarb sauce for ice cream. Do you have a favorite recipe you use? Thanks for “delurking”! Scape soup sounds really good. I don’t know why I haven’t tried planting garlic yet because we use a lot of it! I hope you can find them in the market. I have had scapes, just last summer. We grilled them, and I thought they were pretty tasty. Bob didn’t really have a strong opinion. I’ve never bought rhubarb before, but I do enjoy a little rhubarb pie every once in a while. I like your idea of serving it with ice cream! Perfect for a summer barbeque. The way she prepared it, she didn’t need to add any sugar. It was just right. For gluten free, try Tamari instead of soy sauce. Can’t taste the difference! I will look for Tamari. I don’t know that I’ve ever had it. Now I’m mad. I didn’t know that “scapes” were a thing. I’ve been cutting them off and throwing them out. It makes sense that they would be good though and they look really tasty with those peppers. I am not a big fan of garlic or onions, so I have never tries scapes. I love rhubarb, though! Of course, pie, but also rhubarb ginger jam! Rhubarb ginger jam sounds fantastic! I love garlic scapes AND rhubarb! I usually make a pesto with the scapes and a pie with rhubarb. yay for new-to-you foods! Great idea on the pesto! I must try that. I belonged to a CSA a few years ago. Sadly our midwest summer that year was super cool, so for the first several weeks all I got was kholrabi, which I tried a dozen different ways to make, and never liked it, baby carrots and scapes. I never ended up liking the scapes either! Glad you had a great time with friends – now I want to do a cartwheel! I’ve never heard of kholrabi! Another new to me veggie. I bought scapes last year at whole foods. And it looks like you had a great dinner! I figured a Whole Foods would have something like that. I’ll check mine. You can get garlic scapes at New Seasons Market when they’re in season (which is approx 3 weeks, unfortunately). I saw them there last week. Aw bummer, I suppose I missed my window then!